Soy protein 49%, potato 20% (potato granules, potato flakes, potato starch), tapioca starch, sunflower oil, barbecue seasoning (icing sugar, salt, tomato powder, yeast extract, paprika, acid (lactic acid), onion powder, smoke flavouring, colour (paprika extract, spices & aromatic plants), antioxidant (rosemary extract). 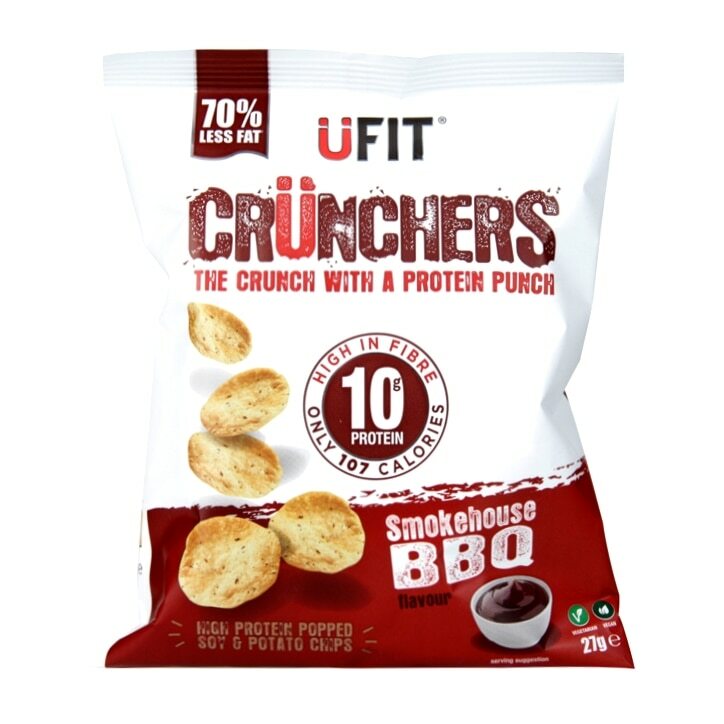 UFIT Crunchers High Protein Popped Chips Smokehouse BBQ is rated 4.7 out of 5 by 6. Rated 5 out of 5 by Noah G from Great product 1st time purchasing these chips and it won't be the last. Brilliant flavour. Rated 5 out of 5 by LouAsh from Love these great taste, extra protein And also vegan, win win for me. Would defo recommend to crisp lovers trying to get an extra hit of protein. Slightly on the pricy side though so don’t buy them as offten as I would like. Rated 5 out of 5 by TommyP from Amazing! As tasty as real crisps! But with 10g protein! I will be a regular.